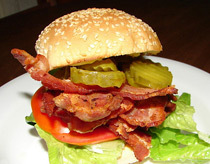 Try a BLT with sweet or dill pickles on a sesame seed bun. Mmmmm. Here's my Bacon, Lettuce & Tomato Sandwich suggestions and my families favorite club sandwich recipe. Use preservative free natural bacon and a quality fresh baked bread for best flavor for both these easy sandwich recipes. Got a BLT sandwich for a lunch idea but you're out of tomatoes? Try this! Replace mayo with mustard, don't toast the bread, add an extra slice of bacon for a Bacon Sandwich. Another tasty alternative is to replace regular bacon with canadian-style bacon. I like my bacon, lettuce and tomato sandwich made with cold crisp iceberg lettuce and fresh whole wheat bread. NOTES: All natural bacon started showing up in the grocery stores a couple years ago. Made without preservatives, nitrates or nitrites, it tastes so much better than regular bacon. I like the Farmland brand. It costs a little bit more, but is well worth it. If you haven't already, I highly recommend giving all natural bacon a try. Kraft reduced fat mayonnaise (with olive oil) has half the calories of regular mayo and tastes great. If you like the taste of mayo, give it a try, doesn't taste like the other reduced fat mayonnaise. I prefer crisp, cold iceberg lettuce with this sandwich. Some people prefer romaine or peppery leaves like watercress or arugula. SERVE WITH: Baked beans or homemade bean soup. In the summer, serve with a cold salad; cole slaw, a cucumber salad or cold marinated vegetables and applesauce. CALORIES: 423 per sandwich. Or, use four slices of bacon instead of six and calories total 358. Slice tomatoes and prepare lettuce leaves. Start toast just before the bacon is finished cooking. When assembling sandwich you want toast and bacon still warm to contrast with cold, crisp lettuce and tomato. Drain bacon thoroughly. To assemble, spread both sides of toast with mayo, place 4-6 slices bacon on toast, top with lettuce, tomato and toast. Cut in half diagonally. Hot weather lunch ideas always include a good club sandwich recipe or two. Add a cold soup and you have a great tasting healthy lunch or dinner. I recommend lean shaved roast turkey breast, canadian-style bacon and fresh bread for best results. The classic version is one of the all time easy sandwich recipes ranking with the BLT sandwich for fast, good and simple lunch ideas. Try a piece of thinly sliced avocado for a healthy and different flavor. SERVE WITH: Coleslaw and gazpacho soup. To assemble, spread one side of each piece of toasted bread with mayo. Place lettuce leaf and turkey on first piece of toast. Top with second piece of toast and place lettuce, tomato and bacon on top. Cover with third piece of toast. Secure with four toothpicks before cutting diagonally into triangles. These two sandwich recipes are sometimes overlooked. But for my money the bacon, lettuce and tomato sandwich and the club sandwich make good lunch ideas easy.